The Japan Rail Pass is truly the bargain of the century, assuming you plan to use several shinkansen (bullet train) services. It entitles the pass-holder to travel freely on: almost all JR services including shinkansen, other than the Nozomi (Tokyo to Hakata) and Mizuho (Hakata to Kagoshima-chuo); the ferry service to Miyajima (see p309) operated by JR; and some of JR’s bus services, though not their highway bus services. 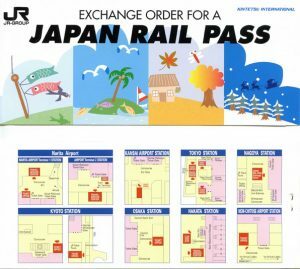 Who can use the Japan Rail Pass? The pass can be used by any non-Japanese tourist visiting Japan under ‘temporary visitor’ status and by Japanese nationals who have lived out of Japan for more than 10 years. It cannot be used by anybody arriving in Japan for employment. The conversion equivalents below are the same as those quoted in the 4th edition of Japan by Rail and are provided here as a guide. (The dollar symbol refers to US dollars). See Updates and news for conversion rates on 12th April 2017 and also for the pass prices if you want to buy the pass in Japan (while the trial is happening). First you need to decide whether you would like a 7-day, 14-day or 21-day pass. The pass runs on consecutive days from the date you start to use it but there is no limit to the number of passes you can buy. The next step is to choose which class you’d like to travel in. There are two types of rail pass: the Ordinary Pass is valid for standard-class rail travel, which is likely to be more than adequate for most people. Seats in Ordinary Class are very comfortable and have ample legroom; on some trains they are as good as first-class rail travel elsewhere in the world. The Green Pass is for those wishing to travel in more style. Green-class carriages (known as ‘Green Cars’) offer wider seats and even more legroom; they also often include extras such as slippers, personal TVs, laptop power points as well as free tea and coffee. However, there are no Green Cars on most services on the Sanyo shinkansen line (Shin-Osaka to Hakata) or on Tsubame (Series 800) shinkansen (Hakata to Kagoshima-chuo) in Kyushu. Most limited expresses have Green Cars but local/rapid trains generally only have Ordinary Class. The most important rule concerning use of the rail pass is that it cannot be purchased in Japan. Having said that at the time of writing it is being sold in Japan on a trial basis; see Updates and news. However, the cost is higher so it is still best to buy it before you go. 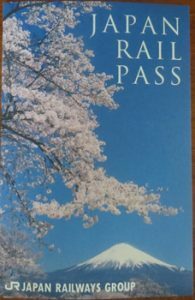 The pass is sold, in the form of an Exchange Order, by authorised agents (see pp36-9) in Japan by Rail for details) outside Japan. For further information visit the Japan Rail Pass website. Notes: Children aged 5 and under travel free providing they do not occupy a seat; those aged 6-11 pay half the adult rate. Prices are fixed in yen, but the charge is payable in local currency. The prices in brackets are for rough guidance only. The exact cost will depend on the exchange rate used by your rail pass agent at the time of purchase. It’s worth shopping around as agencies apply different exchange rates. Is it worth buying a Japan Rail Pass? As stated above we believe the Japan Rail Pass is a fantastic bargain and that it is almost always worth having for a trip to Japan. private lines where possible and JR where that was the only option would have been about ¥21,000. To cover the whole period it would have been necessary to buy a 14-day Japan Rail Pass – since a 14-day Ordinary Class pass costs ¥46,390 it clearly would have been a waste of money. Even buying a 7-day pass for part of this trip would not have been worth it at any stage. didn’t involve any long-distance shinkansen journeys. Even though the quickest way to get between Kyoto, Osaka and Kobe is by shinkansen both JR and private companies operates a range of services between these cities and since they are reasonably close together it doesn’t take long to travel between them. included a trip to Koya-san where access is only possible on a private line (Nankai) and the best value is getting the World Heritage Ticket. This situation would also apply to an itinerary including Hakone as the Hakone Free Pass is undoubtedly the best way to see that area. included several days sightseeing in Tokyo and Kyoto as well as a couple of nights in Tsumago which can only be reached by bus, or on foot. In summary: as we say in Japan by Rail, if you plan to take a return trip on the shinkansen between Tokyo and Kyoto even with a 7-day pass you will almost always save money as you will definitely need to get to and from the airport and are likely to have at least one other journey on a JR service. If you do not plan any long-distance shinkansen journeys it may be worth considering other options – one of the regional JR passes could prove better in your circumstances. Or, it may be better to buy tickets as you go – this doesn’t need to be time consuming as if you have planned your itinerary you could buy most of your tickets when you first arrive rather than whenever you need to travel. Also, if you get an IC card (such as a Suica, Pasmo, or other such card; see p66 in Japan by Rail) and keep it topped up you can use that for most journeys on ordinary trains, whether JR or private.